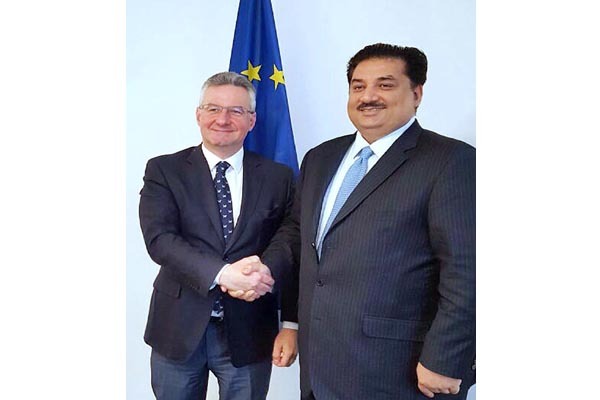 ISLAMABAD, Jan 26 (APP): Minister for Commerce Engineer Khurram Dastgir Khan on Thursday said that GSP Plus offered huge potential for enhancing mutual trade between Pakistan and the European Union. Not only Pakistan’s exports to Europe have increased by 37 percent during the last three years but the export of machinery, chemicals and dyes from Europe, needed to meet up the rising demand of Pakistani products particularly textiles and garments in the European markets has also increased by 14 percent, he added. The Minister for Commerce expressed these views during his meeting with MEP Jan Zahradil, Member of the Committee on International Trade (INTA) in the European Parliament, in Brussels, Belgium, according to a message received here. He apprised MEP Jan Zahradil of various steps being taken by the government of Pakistan to improve conditions of productions in Pakistan and achievements in terms of improving law and order and human rights situation in the country. The Minister also held meetings with Pakistani origin members of the European Parliament, Sajjad Karim, MEP and Chair of the Pakistan Friendship Group and Afzal Khan, MEP and Vice-Chair, Sub-committee on Security and Defence and appreciated their support for Pakistan in the European Parliament. He also met with Mr Elmar Brook MEP and former head of Committee on Foreign Relations. Secretary for Commerce Azmat Ranjha accompanied the Minister in the meetings. He also briefed Mr Cristian Leffler, Deputy Secretary General for Global and Economic Affairs at the European External Action Service.